Fig. 75 Turn signal and main beam lever in the initial position. Right turn signal. When the ignition is switched off, right parking light . Left turn signal. When the ignition is switched off, left parking light . Switch on main beam headlights . Indicator lamp in the instrument cluster lights up. Operate headlight flasher. The headlight flasher comes on for as long as you pull the lever. The indicator lamp lights up. Return the lever to the initial position to switch off the current function. 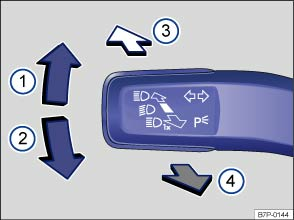 To operate the lane change flash, push the lever up or down to the point where you incur resistance and then release lever. The turn signal flashes three times. The lane change function can be switched off via the Light & vision menu in the instrument cluster display . In vehicles without the Lights & vision menu, the function can be disabled by a qualified workshop. Incorrect use of the main beam headlights can lead to accidents and serious injuries as the main beam headlights could distract and dazzle other road users. The turn signal will only work when the ignition is switched on. The hazard warning lights also work when the ignition is switched off . If one turn signal fails on the vehicle or on the trailer, the indicator lamp will start flashing twice as fast. The main beam headlights can only be switched on if the dipped beam headlights are already on.